Take a Virtual Tour of the hotel.Welcome to the newly renovated Holiday Inn Mansfield-Foxboro Hotel. Centrally located between Providence RI and Boston, we are the ideal hotel for business and leisure travelers. Whether visiting Boston, Cape Cod or Newport, taking in a concert at the Comcast Center (Tweeter Center), or shopping at Wrentham Village Premium Outlets or the new Patriot Place adjacent to Gillette Stadium, the Holiday Inn Mansfield-Foxboro hotel is sure to exceed your expectations. We are the closest full service Holiday Inn hotel to Gillette Stadium, Home of the New England Patriots and the NE Revolution. Our extended stay Foxboro area hotel features 202 newly renovated rooms and suites, 19 rooms of Meeting Space, Grand Ballroom, a beautiful Atrium Courtyard, 2 Restaurants, WIFI, Jacuzzi, Sauna, Indoor Pool, and Complimentary Shuttle Service with a 2 mile radius and an 8,000 sq ft Fitness Center with Aerobics classes. Central to Boston's Logan Airport and TF Green Airport in Providence, the Holiday Inn Foxboro-Mansfield hotel is at the crossroads of Routes I-95 and I-495 offering a safe and convenient alternative to city hotels, with many of the areas most visited attractions less than an hour away. 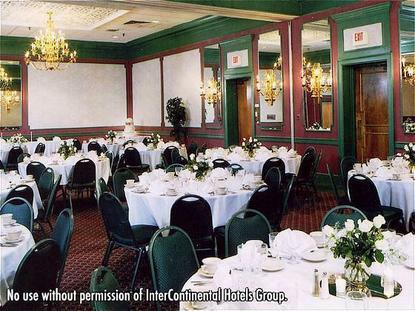 This hotel is committed to providing accessible facilities under the American Disabilities Act. If your accessibility needs are not met, please contact the Hotel Manager on Duty. Should you require additional information regarding accessible facilities for guests with disabilities, please call 1-800-Holiday (U.S. and Canada) or contact the hotel directly. For the hearing impaired, TDD service is available at 1-800-238-5544 within the U.S. and Canada.